← That Heathrow temperature record ? I have looked in detail at aircraft landing data for the North Runway on July 1st to try to answer the following question. Was the heat pulse that produced the record breaking July temperature at Heathrow due to an aircraft, or was it due to a break in the clouds? The balance of evidence is that it was likely caused by the hot exhausts from an arriving China Southern B787 Dreamliner taxiing past the Met station on its way to terminal 4, then exacerbated by a 10 knot SE wind. Shown below is the landing data (thanks to Dave Ward). All times are now in GMT in agreement with the Met data. The flight data in the previous post was wrong – it was in CET! 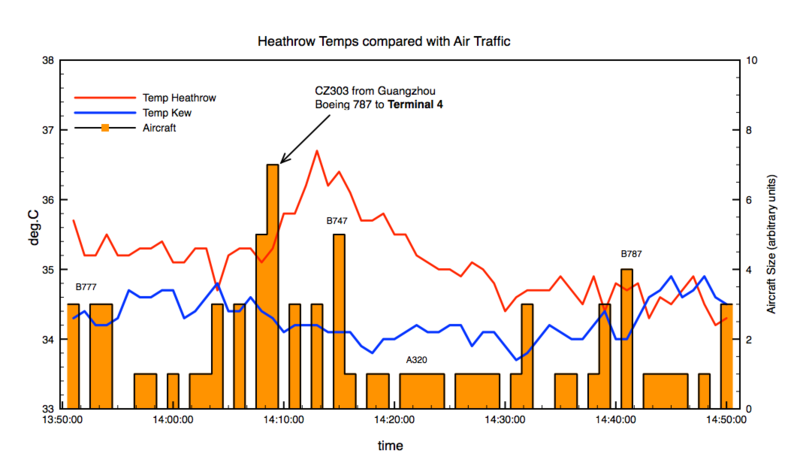 The graph below shows the landing data on the North Runway compared to the recorded temperatures. Smaller jets exit early to reach terminals 1,2,3,5. Larger jets travel further down the runway but still exit lower down in order to also reach terminals 1,2,3 & 5. Only CZ303 will have exited late to reach terminal 4. The 787 also has two of the world’s most powerful Jet engines. Comparison of Hetahrow temperaure measurements (red) with arriving aircraft graded by size. 747=5 units, 787=4 , 777=3, A320=1. CZ303 = 7. The Kew station data is shown in blue for comparison. The alternative explanation for the heat pulse is that it was due to a break in clouds increasing solar radiation. This is shown below. 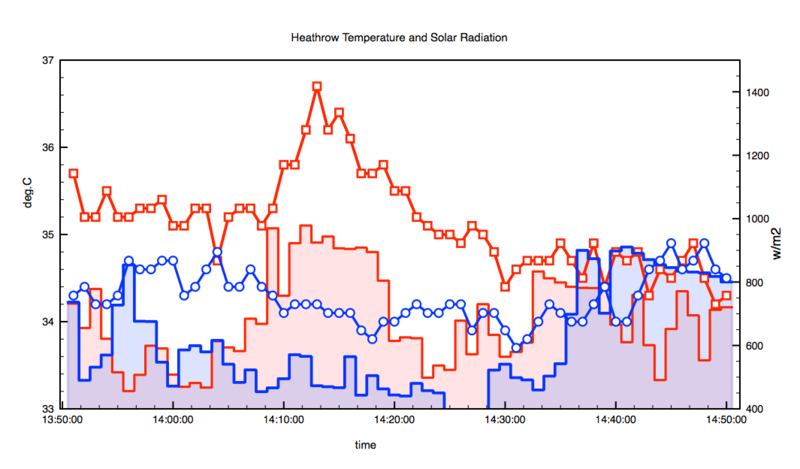 There was indeed an increase in solar radiation at Heathrow coincident with the temperature peak, but if this was the cause then why did a similar increase 30 minutes later produced no response at all. The Kew station shows a much slower response to changing solar radiation. Stephensen screens are also supposed to shield thermometers from the sun and allow air mixing. Therefore the solar radiation explanation is in my opinion inconsistent. I think it is more likely that CZ303 was the real cause. This entry was posted in Institiutions, Meteorology, Science, UK Met Office and tagged Met Office. Bookmark the permalink. 11 Responses to Did an arriving ‘Dreamliner’ cause July’s record temperature at Heathrow ? The Met Office mistakenly believes aircraft magic themselves between runway and Terminal 4 with their engines at idle. “Therefore landing aircraft would most likely have had idle engines by the time they reached the eastern half of the runway, where our observation station is sited. Clive, your analysis is extremely plausible. After a long flight, it is not uncommon for aircrews to taxi clear of the active runway and stop or hold short to get their cockpit affairs in order, await further taxi instructions, sort out complicated taxi instructions from Ground Control, or investigate a minor aircraft malfunction at zero knots, zero AGL and zero Gz. It is further plausible that the aircrew taxied clear on either A5 (as you show) or A6 (the next, hi-speed turnoff to the right/east) and then held short of the parallel A. They could have even crossed A and held short of B on J or L.
The taxi back from 09L to Terminal 4 is complicated, and there could have been congestion requiring Ground Control to hold the aircraft on A5 or A6, or J or L. The weather was nice, so the ILS hold lines on taxiways A5/6 weren’t a factor. The distance from a holding position on A5 to the met sensors is less than 1500′. Even with the 2 GE engines at idle, they are aligned perfectly with the wind direction and pointed at the sensors (as Clive shows). The engine heated exhaust would not disperse much in those 1500′. Holding for a minute or two is not uncommon, and these circumstances can easily account for the spike in the observed temperatures. The Met Office’s defensive dismissal of this highly plausible scenario is unprofessional if not just plain daft. Thanks for your expert knowledge of Heathrow taxiway procedures ! The map is illuminating. If you were to show a persistent correlation between landings at terminal 4 of large aircraft and spikes in the station temperature then you would have a good case. Don’t fall in to the trap of either/or. Although it is possible that the clouds had no effect, more likely they had some effect. You should think in terms of trying to quantify the effect (which in principle could still result in an answer of zero) rather than get to an all or nothing answer. Each day is different. Both runways can be used for takeoff and landing depending on wind direction. The south runway is much nearer to terminal 4. So there would not be a coincidence in that case. I agree not to assume an either/or case, but Stepehnsen screens are supposed to shield thermometers from direct sun. Temperatures should measure air temperature 2m above the ground. Solar radiation heats the ground so air temperature should increase much slower. In this particular case there was a 10 knot wind to aid mixing. I can imagine the temperature of Tarmac rising fast, but not grass and certainly not the air 2m above the grass. Look how slowly Kew warms from 14:30 to 14:50 when the sun comes out there. I’m sure it would be complicated, and probably not worth it, but if I wanted to convince myself of the role of the aeroplane landing it would be possible to do a study looking for temperature peaks controlling for the main variables you mention. Similarly, in assessing the role of clouds I would want to compare not just to Kew, but to many stations on many days. However, thinking about trying to disentangle these factors it’s worth noting that just the fact that this is an extreme (the most extreme recorded) must tell us that many factors were working together. I’m sure that aeroplanes have taxied past the station before, without an extreme temperature. Even when the wind was blowing in the right way. Clouds have cleared before without an extreme temperature. To get the most extreme temperature ever recorded, almost surely you must get a coincidence of factors: the hottest part of the day AND summer AND clouds clear AND an aeroplane taxis past AND the wind is right AND x AND y AND z which we haven’t thought of. If any of them were missing we would not get a record. The main conclusion I think can be drawn is that looking at single extremes in isolation gives limited insight in to broader factors. One step better would be to look at patterns of extremes. While it is quite possible that the Met Office deserves criticism if they claim that air craft cannot possibly have had anything to do with the extreme, I think the bigger and ultimately more important criticism is the highlighting of individual extremes as giving insights in to climate change. I don’t have a problem. If people want to study the relation between patterns of many extremes and climate that’s fine too. But to imply that a single extreme tells us anything much is plain wrong. Of course you are right. To do this properly you would need to find similar spikes under the same conditions. Each day is different. 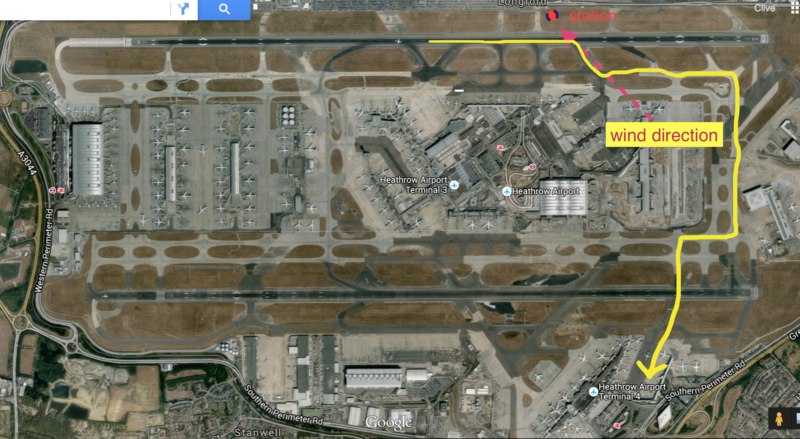 Sometimes the South terminal is used for landing which is much nearer to terminal 4. The basic problem is that the Met Office don’t make available all the data from Heathrow. This 30 minute period around the record is basically all we have. Cearly they themselves could do this analysis. My bet is that there must be occasions when Jet exhausts increase measured temperatures, especially in winter. Thanks Clive. Actually the B787 doesn’t have “Some of the world’s most powerful Jet engines” – not by a long shot! I’ve looked into the 3 arrivals between 14:09 & 14:13, and the China Southern Airlines Dreamliner is a model 787-8 which has 2 General Electric GEnx engines of (according to Wiki) 64,000 lbf thrust. The next arrival is a Turkish Airlines Airbus A330-300 with 2 General Electric CF6-80’s of 72,000 lbf, and then the British Airways B777-200 passes by, propelled by a pair of Rolls Royce Trent 895-17’s. These have a thrust rating of 93,400 lbf in the ER version, which this aircraft appears to be. Note that some B777’s can have as much as 115,000 lbf of thrust each side! Then to make absolutely sure of the temperature “spike” we have BA274, a B747 landing at 14:15. This aircraft is getting on a bit – it was built in 1993 and has accumulated an amazing 101,600 hours as of last December. It’s powered by Rolls Royce RB211-524G2-T-19’s of a mere 58,000 lbf thrust, but remember there are four of them! So with the rapid pace of development we now have a single engine producing more power than a pair did less than 20 years ago. Compare with the sort of planes using Heathrow back in the 50’s – 2 & 4 prop piston engined types, plus early jets like the Comet and the Boeing 707. The latter started out with just 11,200 lbf from each of its four engines, which eventually reached the dizzy heights of 19,000 lbf… Also note that the Airbus A 380 “Super Jumbo” has four engines of (depending on model) 70,000 – 76,000 lbf thrust, and there are plenty of them operating out of Heathrow these days. Now why are the Met Office trumpeting their stations entirely accurate? Dave, also great points about the engines of the various airframes. It would be instructive to get the recordings from Ground Control and re-create the half-hour of aircraft movements around the “record spike.” If two of the “heavies” 787 and 747 were both holding short of A on A5 and A6 waiting for the path to Terminal 4 to clear it could also build the case for the spike. It is incredulous to think a single plane would effect the thermometer. Boeing’s own Dreamliner stats show that these HIGHLY EFFICIENT ENGINES do not throw as much heat as being reported here. http://www.boeing.com/assets/pdf/commercial/airports/acaps/787.pdf Pg 87 starts the velocity and temp contours. I mean please give us a break.